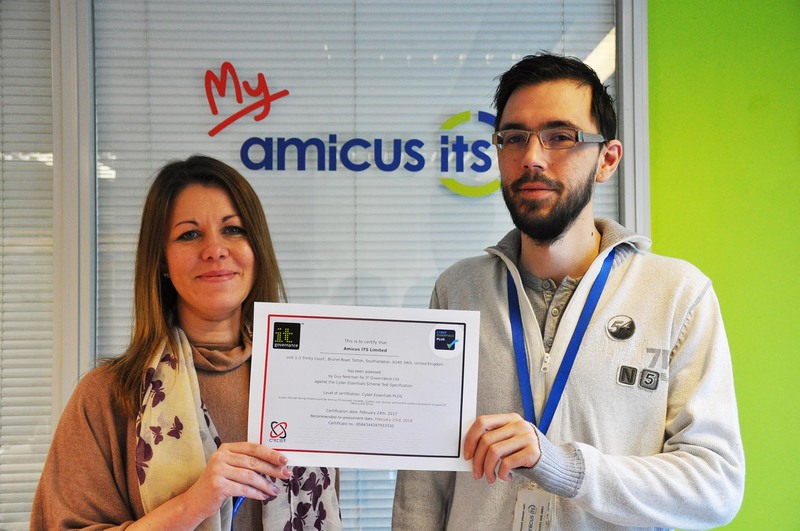 Amicus ITS has announced its award of the higher level ‘Cyber Essentials Plus’ status. This industry-backed technical security scheme seeks to heighten the defences of companies against threat. For Amicus ITS with its long history of serving healthcare, regulated industries and blue chip corporates, it was a logical and natural extension of its existing security standards. Led by Standards Co-Ordinator Emma Purr of Amicus ITS’ Security & Compliance Team, Emma Purr said: “This was a good team effort, supported by members of our technical Escalation Team. Cyber Essentials Plus is normally a first step-in for organisations to gain the more stringent security accreditation, ISO 27001. Cyber Essentials Plus requires a 5-step security approach, whilst information security standard ISO27001 has 114 control requirements in 14 groups and 35 control objectives which must be addressed, so is both very broad and very deep. However, we’ve done it in reverse, having gained our ISO27001 status back in July 2014. This was however no walk in the park and illustrates the critical importance of ensuring robust defences exist around your business. Obtaining Cyber Essentials Plus status has further strengthened our resilience and is great to have on show as another recognised security badge”. 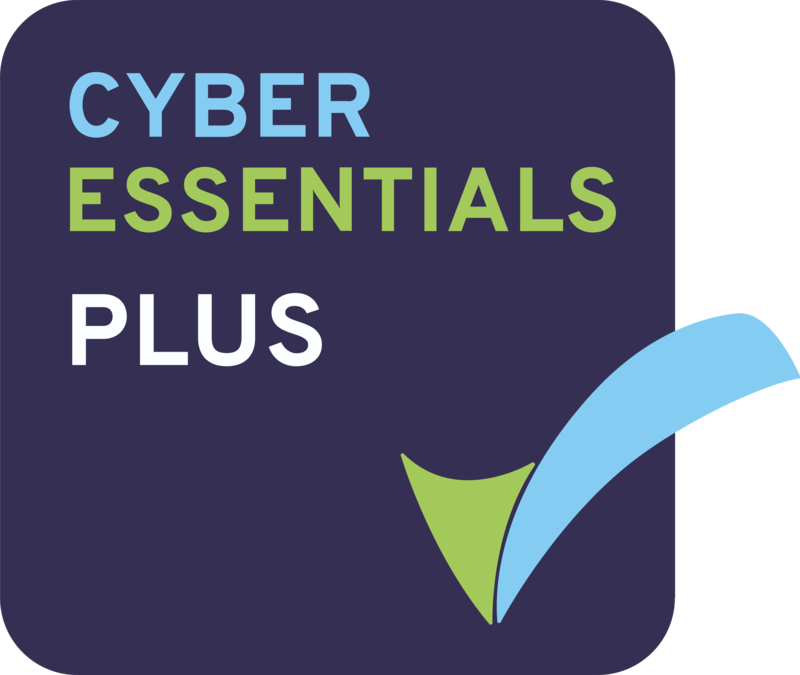 What is Cyber Essentials Plus about? To create the UK Cyber Essentials scheme, the UK Government worked with the Information Assurance for Small and Medium Enterprises (IASME) consortium and the Information Security Forum (ISF) for several years before launching the current system in June 2014. Backers also include the Federation of Small Businesses (FSB), the Confederation of British Industry (CBI) and various insurance institutions. Forming a set of comprehensive and challenging technical controls, it endorses compliance for organisations to create better technical protection from cyber attack and misuse of systems. With standards which are risk-based and prompted by international best practice, they include aspects such as physical security, staff awareness and data backup. What does Cyber Essentials Plus focus on? 2. Secure configuration – ensuring the administration control of all user devices are securely configured, so the rights on what can be downloaded is appropriate and controlled. 3. User access control eg, new starters only have access to the systems they require as part of their job; special access privileges which are restricted to a limited number of authorised individuals, which includes domain admin and the restriction of selected system administrators to be able to make any changes at a high level to internal systems and security firewalls; plus password strengthening and complexity in relation to service accounts. These get changed regularly – and automatically on the exit of any personnel. 4. Malware protection – ensuring that relevant antivirus malware software is installed and kept up to date, which scans files and web locations automatically on access to identify they are safe and also to re-endorse the protection against accessing unsafe websites which get automatically blocked. 5. Patch management – this ensures all software running on company devices are licenced and up to date, installed in a timely manner and that out of date software is removed from devices. Additionally, that security patches are deployed automatically on release. Anyone wishing to discuss business information security issues or about being supported to obtain Cyber Essentials status, should contact the Sales team or speak to JP Norman on 02380 429429.